0 Comments Published by KL Ocs Kid on Monday, January 26, 2009 at 11:09 PM. The second Merseyside derby in a week ended with exactly the same scoreline as the first, this time with the reds scoring the equaliser in a game that Liverpool, once again, should have won. Everton scored from a set-piece in probably their only chance of the game, a game in which Liverpool dominated more than many games this season. The reds skipper combined well with Torres and scored his second derby goal within a week to ensure that a 211th Merseyside derby will be on the cards very shortly - with a Goodison replay up soon. Rafa Benitez left out Robbie Keane from the entire squad, in the pre-match interview stating that Keane missed out because he couldn’t pick 19 players for his squad. It appears Keane paid for his poor performance in Monday night’s game, and the reds reverted to the line up with Gerrard supporting Torres. Liverpool put in a far more impressive performance than on Monday night but despite constant posession couldn’t find a breakthrough. Tim Cahill once again was the scourge of Liverpool’s defence. When Everton managed to get in Liverpool’s half they won themselves a corner which Cahill headed, only for Lescott to get his head on it to send it in to the net. The reds pressured for the rest of the half but Liverpool couldn’t quite punch a hole in a well organised Everton defence. 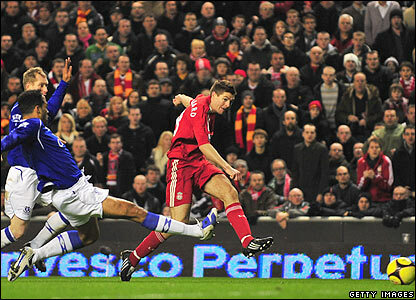 Second half, the reds were even more dominant and eventually a moment of brilliance from Torres and Gerrard unlocked Everton’s defence. Gerrard’s header found Torres, and Torres backflip unleashed Gerrard to fire in a shot from out wide that put the reds back in the game. Liverpool continued to attack, Kuyt had a great chance to finish the tie, and Torres was also unlucky not to put the reds ahead. Even Dossena had a crack from distance to test Tim Howard. As it was, the minutes ticked down and Everton’s defence hung on. Improved performance from the reds, but the killer punch is still missing. Liverpool will travel to Goodison for the replay, although all eyes will be on what team Benitez plays as the reds face a fixture pile-up. 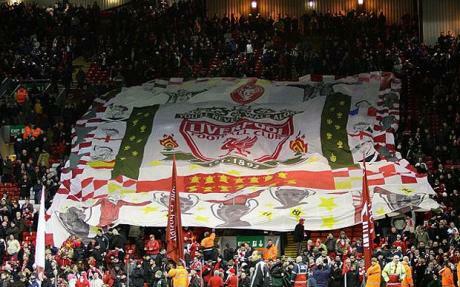 Liverpool: Reina, Arbeloa, Skrtel, Carragher, Dossena, Kuyt, Alonso, Mascherano, Babel (Riera 75), Gerrard, Torres. Subs Not Used: Cavalieri, Hyypia, Aurelio, Benayoun, Leiva Lucas, Ngog. Everton: Howard, Hibbert, Jagielka, Lescott, Baines, Anichebe (Gosling 71), Castillo (Rodwell 76), Neville, Osman, Pienaar, Cahill. Subs Not Used: Nash, Yobo, Van der Meyde, Jacobsen, Jutkiewicz. 0 Comments Published by KL Ocs Kid on at 11:08 PM. Wow. We knew things were bad for Red Rob, but to be grouped below the distinctly un-Deadly Dirk in the non-scoring "strikers" club must be a new low. Kuyt may have been a striker once. But it seems Rafa has doggedly coached all those selfish instincts out of him, so that the Diggler now enjoys tracking back and winning throw-ins more than scoring goals. No one is suggesting Keane has played well at Liverpool. Air-shots do not a career make. But Benitez’s treatment of him also seems less than exemplary. If Rafa wants rid, then jet-blasting any remaining shred of confidence off Keane can only lower his transfer value. And the whole weekend was yet more evidence that Rafa is juggling too many plates. Not only is he playing mind games with his own players, compiling dossiers on Fergie, contract-wrangling with the club's owners, playing politics with the club's possible new Arab owners, trying to plot Liverpool's first title race in decades and battling a vicious attack of the kidney stones, he's now picking on David Moyes too. 0 Comments Published by KL Ocs Kid on Sunday, January 25, 2009 at 11:13 AM. Veteran defender Sami Hyypia believes Liverpool can wipe away the memory of their derby-day blunders against Everton and beat the old enemy in the FA Cup. Everton produced a defiant performance in a 1-1 draw when the sides met in the Premier League at Anfield, and will be confident they can again confound their neighbours in the cup's fourth round on Monday (AEDT). But Hyypia believes Liverpool will give a better account of themselves second time around. The Finn was frustrated with Liverpool's inability to hold on to their one-goal lead five days ago, when Tim Cahill headed home a late equaliser. With a place in the fifth round now at stake, the defender is expecting a much-improved performance against the Reds' cross-city rivals. He said: "Hopefully we can play our own game this time, pass the ball better and create more chances. "We were disappointed to lose a late goal in the first game and there were a lot of disappointed faces in our dressing room afterwards. "It was a normal derby in the sense there were lots of challenges and a number of misplaced passes, but I'm hoping we can improve for the second meeting. "I think Everton will come and look to play the same way. They will work very hard, they will close us down and they will be dangerous from set-pieces. "We were disappointed with how many set-pieces we gave them in dangerous areas on Monday night. We gave too many fouls away and in the end it cost us." With Liverpool facing a crucial league clash at Wigan just three days later, it is possible manager Benitez will make changes for this weekend's clash. But Hyypia believes Liverpool's extra squad depth will result in the tie swinging in their favour. He said: "There are not many days between the two games for the players to recover, but if you look at the two squads then maybe we have more options. "Everton have a lot of injuries and can't change their team as much as we can, but we'll have to wait and see what happens." There is little doubt that the cup tie will be overshadowed by yet another potential takeover saga at Anfield. With the club's American owners Tom Hicks and George Gillett involved in talks with the super-rich Kuwaiti Al-Kharafi family, the task of overcoming Everton could be a major distraction. But Benitez wants his players to concentrate on producing the right reaction to Monday's disappointing draw. The Spaniard, who insists skipper Steven Gerrard is in the right frame of mind to play despite his court appearance yesterday, said: "It is always important that you respond well if you suffer a disappointment. "I have been really pleased with the last two training sessions we have had because the attitude of the players has been really positive. "We have been analysing Monday night's game and we know that we made some mistakes. So we will try to adjust the small details that can make such a big difference. "But it is important to remember that we drew on Monday night, we did not lose the game and we have not lost any game for more than two months." He added: "We were not playing to our level on Monday night, we know that. But we still could have won the game and had it not been for a mistake with just a few minutes to go we would have done. "This means that if we play the way that we know we can then clearly we must have a good chance of winning the cup tie." Benitez has not considered resting Gerrard following the court appearance. He said: "Steven was working as normal in training and he was scoring goals and you could see the spirit was there that he always has. "Steven is in the right frame of mind. I have watched him in training and he is fine." 0 Comments Published by KL Ocs Kid on at 11:08 AM. In May 1989, little more than a month after the Hillsborough disaster that cost 96 supporters their lives, Liverpool and Everton fans stood together on the Wembley terraces and chanted one single word: "Merseyside." The ultimate display of solidarity from a city in mourning confirmed the clash between Liverpool's red and blue halves as England's friendly derby. Twenty years on, that reputation is long gone. Many of the same fans who sang together at Wembley will attend Sunday afternoon's FA Cup clash and hear spite, vitriol and bile pour from the rickety old stands of Anfield. Merseyside police have joined both clubs in appealing for an end to the vile taunts directed at opposing players and supporters alike. If Monday night's game is anything to go by, that call is likely to go unheeded. "I remember in my first derby I ran out looking at the Kop and a whole corner was blue and white," said Gary Ablett, a man who has seen the derby from both sides of the Merseyside divide. "They wouldn't let that happen now. The police fear it would kick off. What do you do, just let them carry on what they're singing, or do something about it?" Ablett, now Liverpool's reserve team coach after a spell running the under-18s at Everton, made the opposite journey as a player. Graeme Souness sold him to Howard Kendall after nine years at Anfield in 1992, a move which the boyhood Liverpool fan admits was not easy. Even for a returning hero, the signs when he visited his former side suggested the friendly derby was no more. 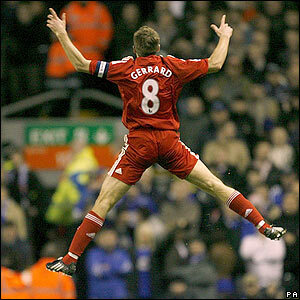 "One game at Anfield I came off with a knee ligament injury. I wasn't really aware of it coming off but certainly Joe Royle, the manager, was quite affected by it," Ablett said. "He said the reaction of the Liverpool fans would make him think twice about bringing a player across the park and subjecting him to that. "On the pitch, it's still ultra-competitive. You go in for the ball and you have to come out with it. Before, we had players like Ronnie Whelan and Steve McMahon, Everton had Joe Royle's Dogs of War. "They were lads who could look after themselves. But you would still see both sides picking each other up, making sure everyone's OK. It's still like that, as much as the rules allow. It's on the stands that it's changed. "It's not a nice atmosphere now, it's turned vindictive, vicious and the chants are horrific. "It's hard to put your finger on one thing that's changed it. Whether it's the success Liverpool have had in recent years, or winning the Champions League and qualifying when Everton finished fourth, it's hard to put your finger on one thing that's changed the atmosphere. "Unfortunately, I've certainly heard Everton fans question whether Heysel, coming when it did and getting them barred from Europe, might be a factor. They were in the ascendancy but didn't get to compete at the highest level. I don't know whether that's got anything to do with it." As the tension in the stands has increased, arguably the significance of the game has diminished. Liverpool fans now look down the East Lancs Road for their major derby, rather than across Stanley Park. Where Liverpool once faced Everton with both sides aiming for the title, for the red half of the city the game is now just a local skirmish in a battle waged on a national scale. Ablett said: "It could be that it's more important now for Everton than Liverpool. It always used to be the fixture you'd look for when you got the list, but for Liverpool that's maybe Manchester United. "When I was playing, Everton were a major force, right up there with us. They were the major rivals because Manchester United hadn't really got going. For Everton, though, they maybe still see this as the biggest game of their season. Liverpool have United, Chelsea, Arsenal and the Champions League ties, too, and they're all massive games." That is not to say that those in blue will be more fired up than their hosts this afternoon. Ablett is well aware of Everton's Scouse spine – he helped to develop most of them – but has also seen first-hand Liverpool's foreign stars become imbued with the spirit of the club. He said: "A majority of the lads who have come in have developed an understanding of what the city's all about and part of that is working out why the game means so much to the fans, on both sides." 0 Comments Published by KL Ocs Kid on at 11:03 AM. Former teenage prodigy Pennant, 26 last week, arrived at Pompey on a six-month loan deal after finding himself out in the cold at Anfield since October. Although he joined Arsenal for a STG2million ($A4.2million) fee from home-town club Notts County 10 years ago and became their youngest player in a competitive match at just over 16, he was rarely given a chance by manager Arsene Wenger. Pennant had loan spells at Watford and Leeds before joining Birmingham who sold him to Liverpool for STG6million ($A12.6million) in 2005. He forced his way into a star-studded team and played in a Champions League final. But this season, after coming back from a broken leg, Pennant made just three starts for the Reds - the last in a 1-0 win over Portsmouth in their new manager Tony Adams' first match in charge - and claims he was a victim of manager Rafael Benitez's preference for foreign talent. He said: "I don't know what it is with me and Rafa. He knows I've got the ability and that I'm capable of playing in his team. "But when you find yourself suddenly training on your own - when all the other boys are out there - and it's just a couple of years after playing in a Champions League final, you've got to wonder where you are going. "A lot of people at Liverpool told me they can't understand why I've not even been given a sniff of a chance even on the bench, and I don't know either because I played 34 games last season and suddenly I can't get in." Pennant told Sky Sports he felt his career was "rotting away" in Liverpool's reserves and that he simply had to review his options. "I've come here to Portsmouth to do a job for them and when my contract is finished in July then the world's my oyster," he said. "I don't think Liverpool will be watching or coming back for me. They can't say anything to me really. "All I've said to Rafa in the last couple of seasons is 'good morning' and things like that, but you can't knock him. It's his team and he's won plenty of trophies, including the Champions League. "But it does look as if, apart from the obvious ones, you stand a better chance of being in the team there if you are a foreigner." Adams was firmly established as Arsenal and England captain when Pennant arrived at Highbury from Notts County. "He's always been a quality talent," the Pompey boss said. "Signing a player like Jermaine wasn't a major priority but he's a major addition to the squad. "I've no fears about him not having played for a while because he's bright and quick and naturally fit." Adams is glad to have Pennant available, particularly after a scan revealed that Croatia midfielder Niko Kranjcar has torn a groin muscle and is likely to be out long-term. Kranjcar, who has already admitted he expects to be sold by Pompey in the northern summer, missed the beginning of the current campaign following an ankle operation and has made only 10 starts since returning in November. "It looks a bad one and we'll miss him for what I believe will be quite a while," said Adams. Regarding Sunday's FA Cup fourth-round tie against Coca-Cola Championship Swansea at Fratton Park, Adams added: "They are playing probably some of their best football in the division at the moment. They destroyed Reading last week with their passing in a 4-3-3 set up. "I don't think I can give them bigger praise than that and although we'll start favourites as the holders we've got to stay as resilient as we have been in the last few games to avoid being punished." Adams has dismissed fears that his England goalkeeper David James is only playing on thanks to a painkilling injection in his knee. Adams told the Portsmouth News: "He will be absolutely fine and I can't imagine he won't play tomorrow. "He doesn't need an operation and probably doesn't need another injection either." Liverpool: Rumours - Roy's Shopping List?